Lady Tremaine's daughter by blood, Drizella has been spoiled rotten and as a result subjects Cinderella to constant bullying. 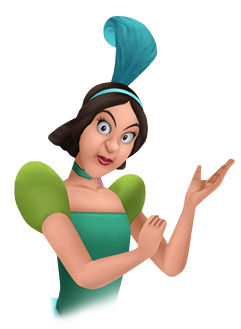 According to the Fairy Godmother, Drizella's heart is full of darkness due to the presence of Cinderella's virtues, and this darkness often manifests as bitter jealousy when she rips apart Cinderella's dress and later, unintentionally conjures the Symphony Master Unversed to attack the ball. She is tied to her mother's apron strings, a fact that does not change when their collective negativity consumes them all.